Showing 46 articles from May 3, 2017. LOUISBURG -- Efforts to return comprehensive health care to Franklin County were bolstered this week when officials announced that Duke Lifepoint secured more than $10 million they will put toward mental health care at its proposed Franklin County campus. The proceeds are $4 million more than Duke Lifepoint projected it would receive from the sale of Dorothea Dix and is almost half of the roughly $24 million they are attempting to secure for the fully realized behavioral health services they plan to offer as part of their health care package at the old Novant Health Franklin Medical Center site. Would $2 million fix county radios? YOUNGSVILLE -- Law enforcement leaders told county staff that its $11 million emergency radio system can pose dangers and put officers' safety at risk -- after years of tinkering, updates and promises. County Emergency Communications Director Christy Shearin said there still might be a fix, but it'll cost almost $2 million. Emergency response users have noted issues with garbled audio, dropped calls and other problems with the radio system since its installation in the fall of 2012. LOUISBURG -- If residents who attended a public hearing about the future of the Tar River Center for History and Culture get their wishes, that organization will be putting increased focus on the Tar River as well as "Depot Hill" in Louisburg. The hearing, attended by about 25 people Tuesday night, saw a wealth of ideas, topics and suggestions tossed out -- and then attendees voted on their priorities. The official list of those priorities will be announced in a few days. FRANKLINTON -- Town officials and the police department recognized two officers for their work in tracking down an alleged child sexual predator. Last month, Det. Sgt. Andrew Bishop and Officer Adam Carlson were part of a local, state and Internet crimes task force effort that resulted in the arrest of a Maryland man accused of seeking out a 14-year-old Franklinton girl for sexual exploitation. 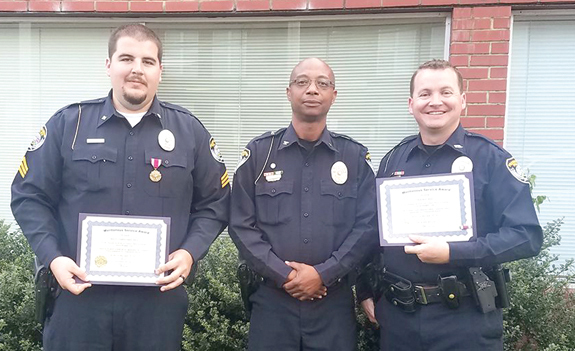 During the town board's April meeting, Police Chief John Green Jr. presented the two officers with a Merit Award for their work. 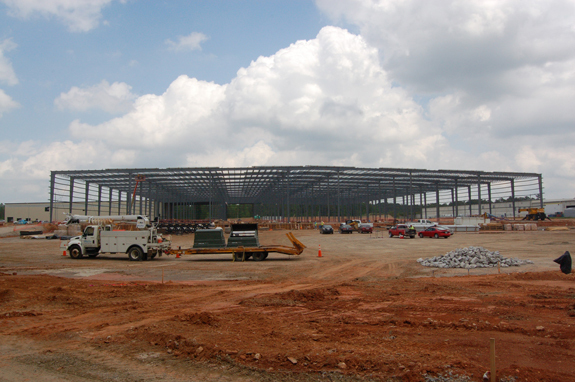 YOUNGSVILLE -- K-Flex, which is in the midst of a $45 million expansion that will double the size of its Youngsville plant, took a breath last week to recognize a milestone in the project -- the installation of the final column in a 300,000-square-foot distribution center. With the completion of the distribution center and a 60,000-square foot manufacturing area, the company stands poised to double its current footprint and add 100 new workers to its roster of about 195 employees. Please: No more money for radios that won't work! Gee, you'd think an old geezer (like me) would be smart enough not to ask certain questions of certain people. At the happy retirement luncheon for Louisburg Police Chief Rick Lassiter (lucky guy!) I was in a roomful of law enforcement folks -- and asked a question of a couple officers that I thought really needed answered. 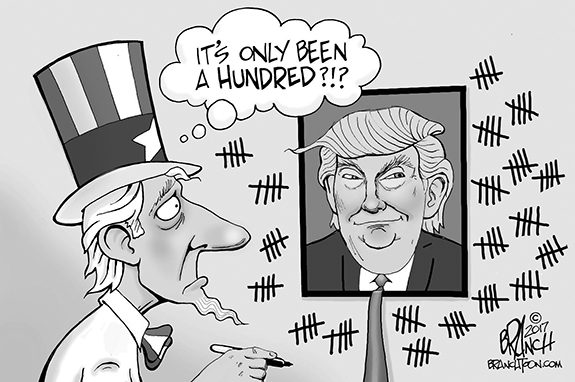 Never let the fox guard the hen house! We thought everyone knew better than to put the wily, hungry old fox in charge of the flock that provides breakfast eggs and sometimes Sunday dinner -- but we were wrong. Some legislators in our state's General Assembly want to do just that -- except they are putting at risk your right to know what your government is doing for you, and to you! On a sun splashed morning at Double D Equestrian Center, there were two things that told the story of the Franklin County Fun 4-H Livestock Show -- the smiles on kids' faces and their brightly-colored posters designed to tell what 4-H is all about. For the past five years, the Franklin County Cooperative Extension Office has hosted a livestock fun show as a way of introducing the concept to children who might be new to animal care and those who have plenty of experience. Kindness counts, so why is it so rarely practiced? Events touch people different ways. The news is filled with tragedy; most of it is distant from our lives. Evil people use sarin gas to kill women, men, and children, in a far off place called Syria. How did learning of this affect you? Even babies were murdered by this odorless, colorless, weaponized nerve gas agent. 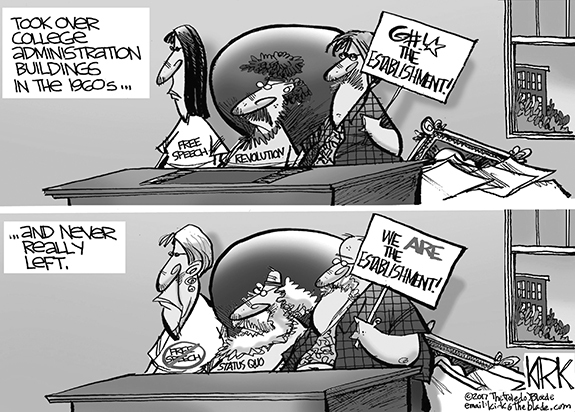 It has all faded from the headlines now, overtaken by other horrible events. Has it also faded from your memory? Recently the Person Place Preservation Society presented a roster of extraordinary buildings on its biannual Homes Tour. WAKE FOREST-- Aileen Fuller Wilder, 94 died Tuesday, April 4, 2017 (two days before her 95th birthday) at Hillside Nursing Center in Wake Forest. Funeral services were held Friday April 7, at Woodland Baptist Church, Wake Forest. GREENSBORO--Funeral services for Oliver "Skillet" Newell Jr., 62, who died Monday, May 1, 2017, will be held Saturday, May 6, at 2 p.m. at Jones Chapel Baptist Church in Louisburg. 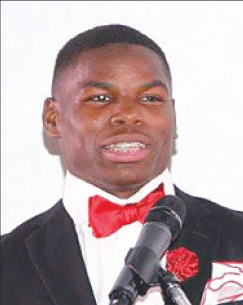 CASTALIA--Funeral services for Reggie "R.B." Johnson, 66, who died Monday, April 24, 2017, were held Sunday, April 30, at New Liberty Baptist Church in Louisburg, with the Rev. Sidney Dunston officiating. Burial followed in Oakwood Cemetery in Louisburg. 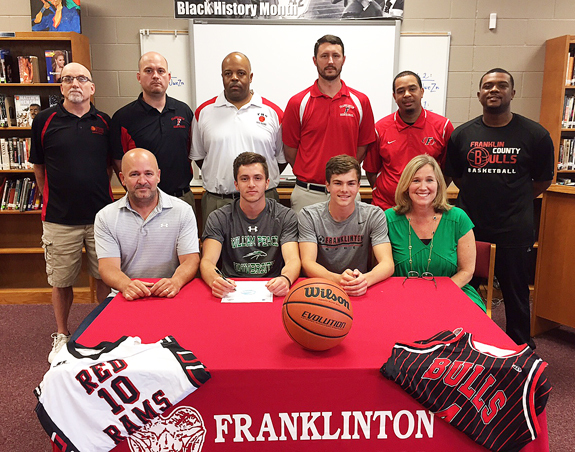 FRANKLINTON -- Smith Gupton reached a harrowing crossroads early in his athletic career at Franklinton High School. While growing up, Gupton was a standout in both basketball and soccer -- the same two sports his older brother, Cole, had excelled at for the Red Rams. Smith's goal, however, was to play sports on the collegiate level, and he saw the best opportunity for that in basketball. 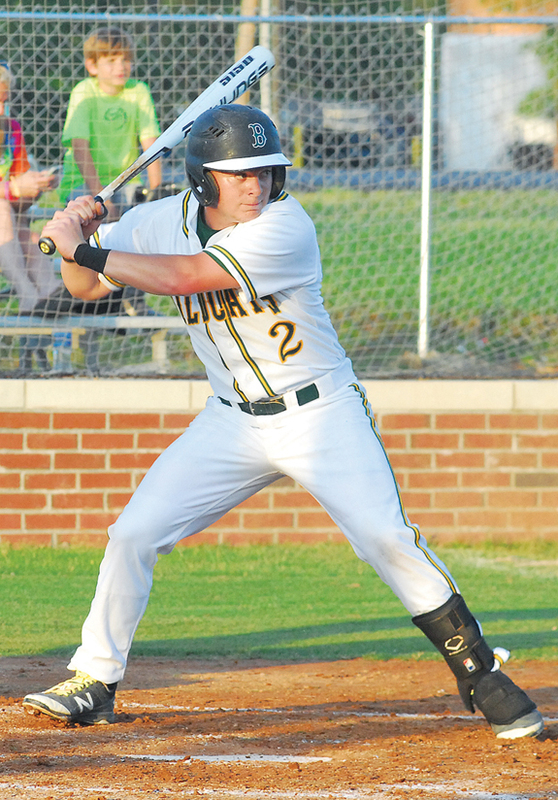 Davie Morgan of Bunn High School led off the bottom of the first by reaching base. 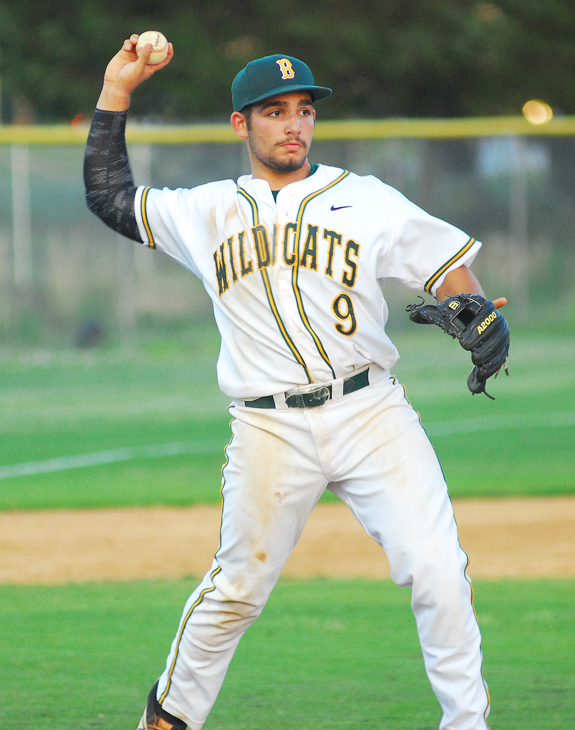 BUNN -- With three freshman starters and underclassmen excelling just about everywhere on the field, it's almost unrealistic to think that the Bunn Wildcats could be competitive on the baseball diamond this spring with a veteran, proven club like the South Granville Vikings. After all, the Vikings have experience across the board, have reached the state finals the past two years and have a pair of Division I pitchers in Justin Bullock (NC State signee) and Holden Laws (NC State commit). 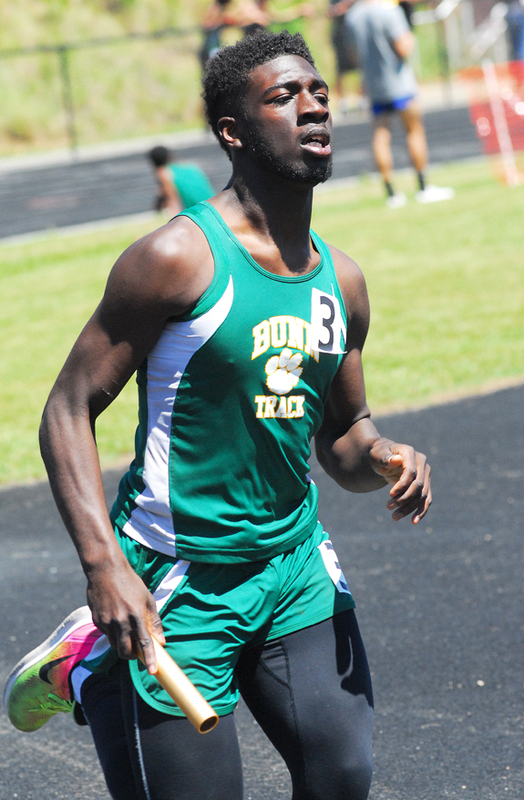 FRANKLINTON -- Franklinton's swansong in the Northern Carolina Conference Track and Field circles was destined to have an unhappy ending. Seeking their fourth straight boys league crown before departing in the off-season for the Big East Conference, the Red Rams were instead held off by upstart Durham School of Arts at Tuesday's NCC Championships at the FHS Football Field. In winning its first league title since 2003, DSA collected 187 points, compared to 178 for the Red Rams. 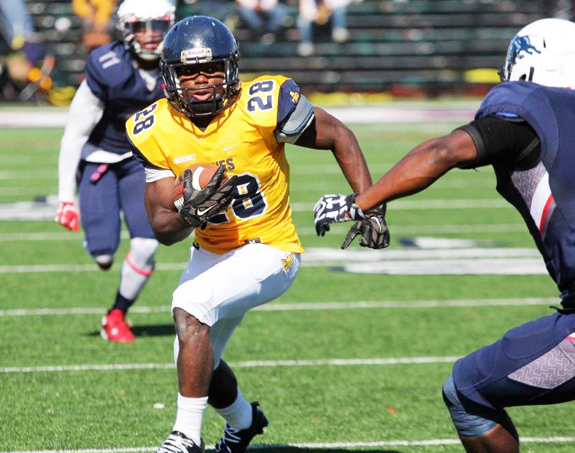 BUNN -- Tarik Cohen has devoted his entire career to exceeding expectations -- so it was no surprise when he was picked earlier in the National Football League Draft than most experts had anticipated. The Chicago Bears' interest in Cohen has been circulating for quite awhile, and the Bears made it official when they selected the former Bunn star last Saturday in the fourth round (117th overall) of the draft. LOUISBURG -- After the opening game of the series, Louisbug College appeared well on its way to advancing into the semifinals of the Region X Baseball Tournament. In order to make it that far, the Hurricanes needed to first defeat USC-Sumter as part of a best-of-three series last weekend at historic Frazier Field on the LC campus. WASHINGTON -- The Class 1-A East Regional Golf Tournament provided a bittersweet moment for Louisburg High School this Monday. 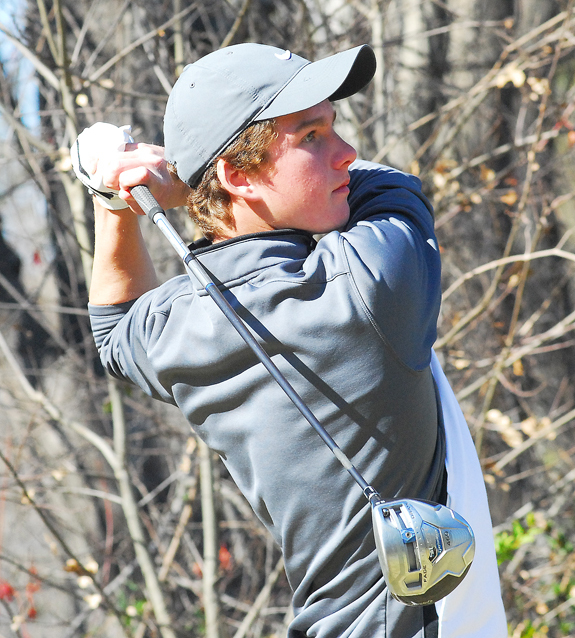 The Warriors had two participants competing in the regional, which was held at Washington Yacht and Country Club. Christian Rowe was unable to advance to the state competition. Reed Wheless found some mojo on the back 9 holes to advance to states for the 4th year in a row. BUNN -- Bunn High School senior D.J. Jones has earned a prestigious spot on the East Team for the upcoming North Carolina Coaches Association's East-West All-Star Football Game. The event will be held July 19 at Jamieson Stadium on the campus of Greensboro Grimsley High School. This past season, Jones rushed for over 1,800 yards and 20 touchdowns while helping the Wildcats reach the second round of the Class 2-AA State Playoffs. ZEBULON -- Isan Diaz extended his hitting streak to 11 straight games with a three-run home run in the sixth and Corey Ray blasted a three-run double in the eighth, but the Carolina Mudcats fell one run shy in their comeback bid while losing 8-7 to the Astros on Monday night at Five County Stadium in a Class A Carolina League baseball event. Carolina (10-14) trailed 5-0 in the sixth before Diaz blasted his three-run shot to right off reliever Justin Ferrell. 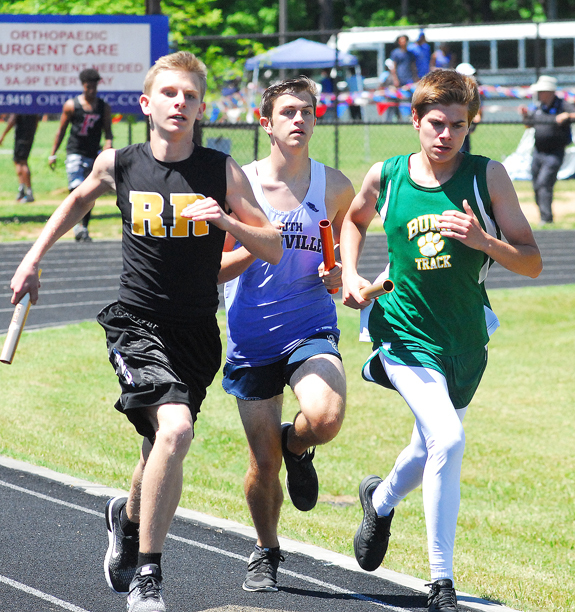 Bunn's Christian Selletto (right) tries to fend off a pair of opposing runners during the Boys 3200 Relay at Tuesday's NCC Track and Field Championships at Franklinton HS. 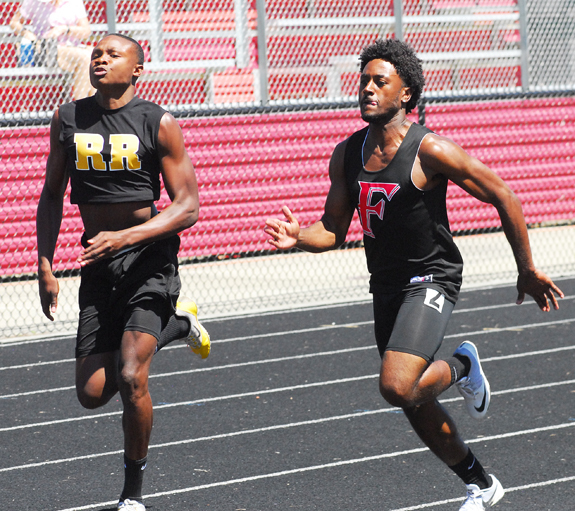 Franklinton's Brandon Reese (right) takes part in the Boys 100 at the annual Northern Carolina Conference Track and Field Championships at the FHS Football Field. Bunn High School pitcher Isaiah Ortega retires a South Granville batter at first base during last Tuesday evening's home diamond decision. 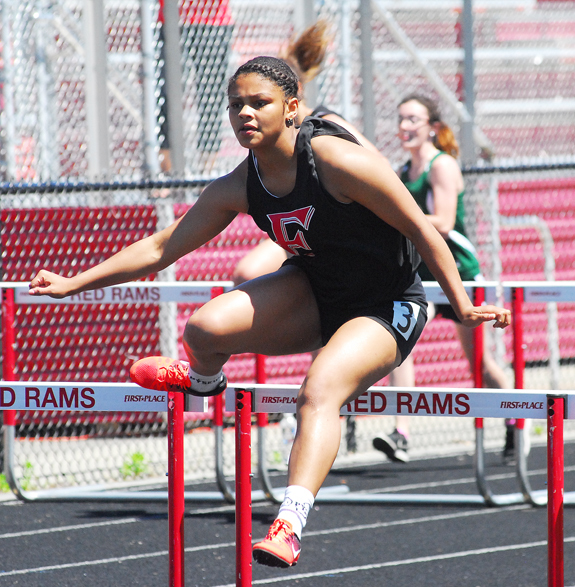 Franklinton High School's Nia Richardson speeds toward the finish line in the Girls 100 Hurdles at the NCC Track and Field Championships. Residents of Louisburg Healthcare and Rehabilitation Center went all out for Easter this year. 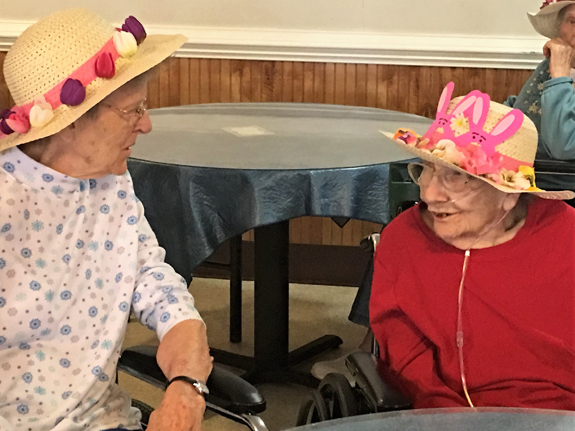 The ladies made their own Easter hats, then had a parade, watched an Easter egg hunt with staff members' children, and then a party.Above photo, Leola Haley (left) chats with fellow resident Dorothy Autrey. 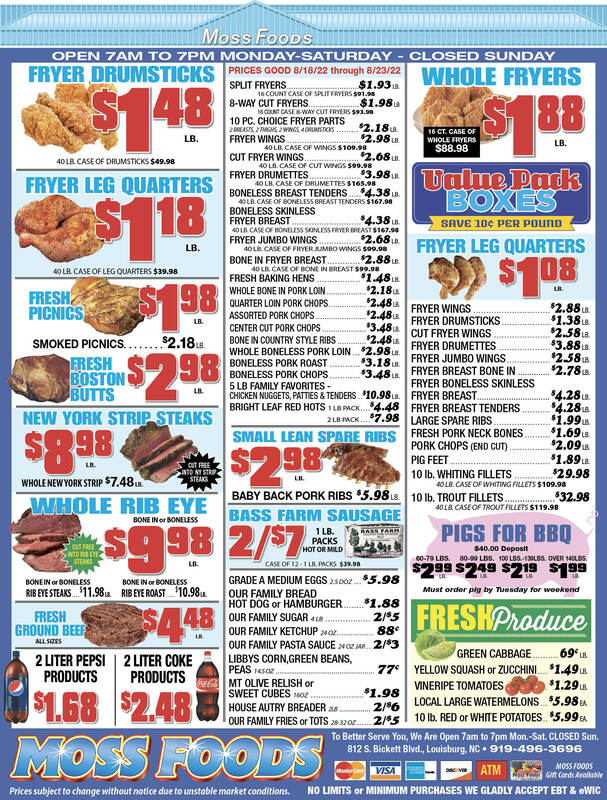 RALEIGH -- Girl Scouts - North Carolina Coastal Pines has announced its top sellers, including Scouts from Franklin County. R.J. McCarthy has just released a new crime novel, "Where Seldom is Heard," a fourth for the writer. 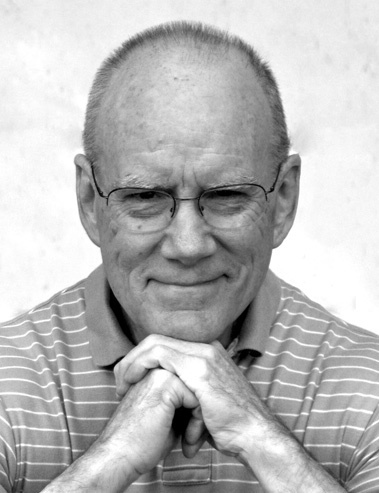 Departing from his previous novels in his Tony Quarry/ Carolina Mystery series, "Where Seldom is Heard" is set on Indian reservations in the Dakotas. Threading through the story is the pathology of crime toward women on an Indian reservation balanced against the complexity of Indian reality that rejects a one-dimensional white notion of reservation life, i.e. casino wealth versus abject poverty. 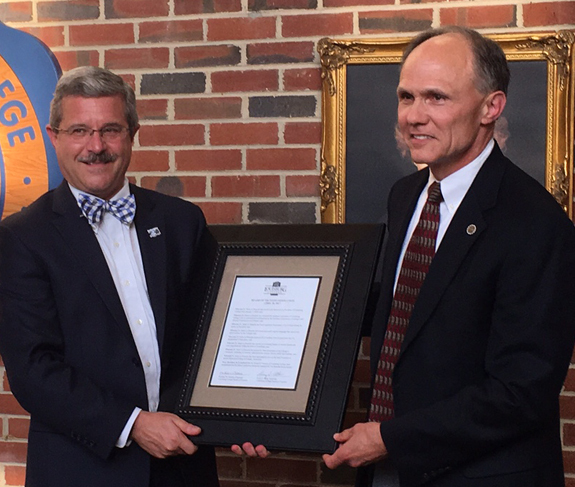 Mike Boddie, president of restaurant operations at Boddie-Noell Enterprises, Inc., and chair of the Louisburg College Board of Trustees, received the college's Presidential Medal during the spring trustees meeting. During that April 20 meeting, trustees also named the board room of Main Building after Dr. Mark La Branche, president, who is leaving after more than eight years to lead Martin Methodist College in Tennessee. LOUISBURG -- Earlier this month, school officials received word that the district was awarded a $192,000 technology grant from the Golden LEAF foundation. 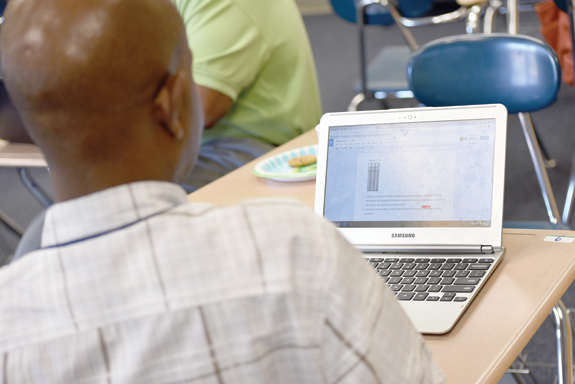 The grant will build on the district's current technology initiatives by providing additional Google Chromebooks, compact web-based laptops, for high school students during the 2017-18 school year. Eight Louisburg College students have earned federal certifications in hazardous waste operations and emergency response, which gives them credentials to be environmental health and safety directors, a burgeoning profession. The U.S. Occupational Safety and Health Administration certificate is the second federal certification this year for some of the students, who also completed a solar energy class last fall that culminated in the exam for certification by the North American Board of Certified Energy Practitioners. 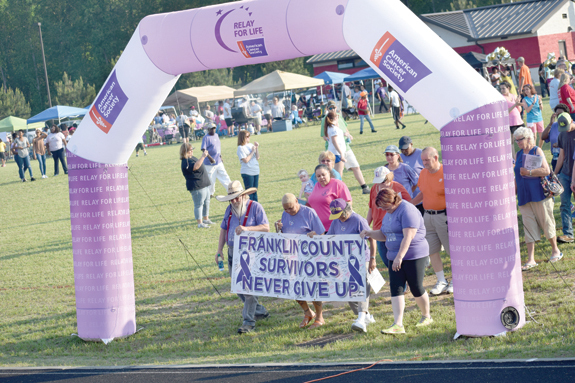 People from all walks of life came together last Friday night at Franklinton High School to help in the battle against cancer. 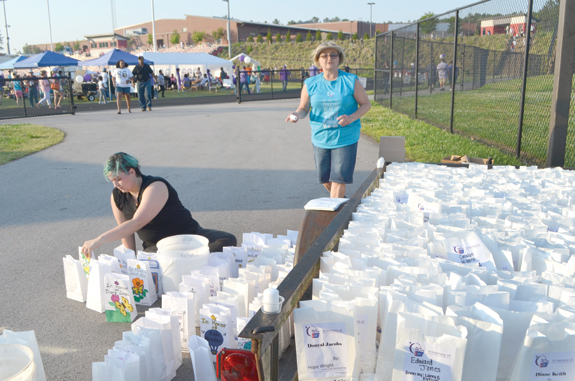 This year the goal of the annual Relay for Life event is $100,000 and the group has already topped $84,000. To make a donation to stop cancer call Danette Cheatham at 919-906-5002. LOUISBURG -- The Franklin County Board of Commissioners adopted an historic preservation ordinance and agreed to create a commission responsible for protecting the county's historic integrity -- giving the county a level of control over properties they deem to be of historic significance. "This is not intended to be punitive," said County Manager Angela Harris. "[It's intended to be] in collaboration with homeowners in the community in an effort to preserve these properties." LOUISBURG -- A Franklinton woman accused of stabbing a woman during a fight is slated to appear in court next week. 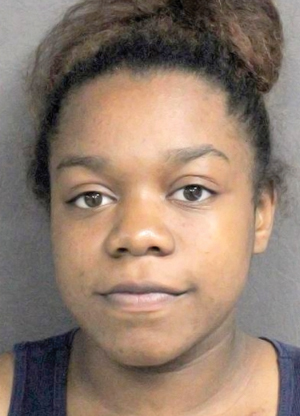 Franklin County sheriff's deputies allege Latoya D. Burnette, 19, got into an argument with a 21-year-old woman regarding an ex-boyfriend during the early morning hours of April 28. The two agreed to meet at a convenience store along N.C. 39 near Dyking Road to fight at about 12:40 a.m. FISHING FOR A CAUSE. The annual bass fishing tournament on Kerr Lake, hosted by the N.C.B.A.S.S. 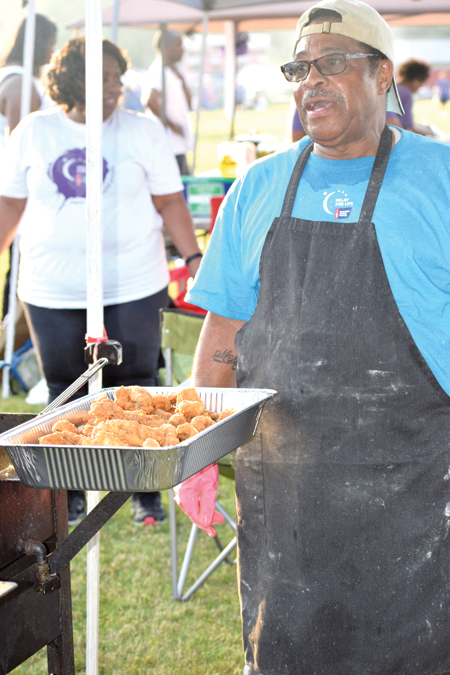 Federation Nation to benefit the Boys & Girls Clubs of North Central North Carolina -- attracting 66 teams -- was held on April 15. 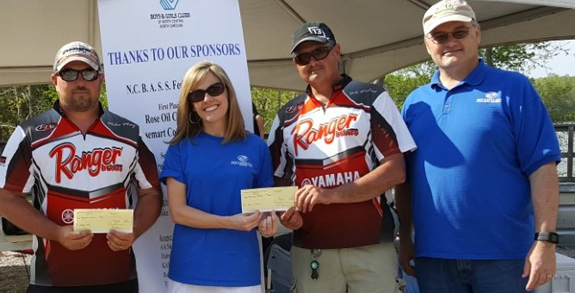 Tanya Evans, Boys & Girls Clubs of North Central North Carolina Chief Volunteer Officer, and Floyd Johnson, Chief Executive Officer, presented the winners of the 2017 Bass Fishing Tournament. In top left photo, Mike May and Dale Winstead are presented with the $2,000 second place prize with a total weight of 18.13 lbs., with Evans and Johnson. PHILADELPHIA -- On the heels of the Penn Relays, Franklin County will host its annual Special Olympics Games this Friday in Franklinton. One of those competitors, Samantha Munson, placed first at the 123rd running of the Penn Relays at the University of Pennsylvania, held April 27-29. Special Olympics participation took place on April 28. The Franklin County Third Annual Film Festival, sponsored by Franklin County Arts Council and Franklin County North Carolina International Film Festival (NCISAFF), was another hit with a full house attending at the UpFront Gallery in Franklinton for a day of film screenings. LOUISBURG -- The Franklin County Board of Commissioners approved an incentive that Palziv will use to create more jobs and invest millions more into Franklin County. During the board's April 24 meeting, the board agreed to a $131,982 incentive to the company, a leading manufacturer of polyethylene foam-based products used in packaging, automotive, construction, orthopedic and the leisure industries. ROXBORO -- A wood mill company has invited Franklin County and surrounding area woodland owners to learn more about the industry. The Franklin County Cooperative Extension has arranged for those interested in the activity to take part in a tour of Louisiana Pacific Mill on May 23. The Louisiana Pacific Mill in Roxboro manufactures Oriented Strand Board (OSB) which can be used for walls, roof, and flooring applications. It is the largest manufacturer of OSB in the world. 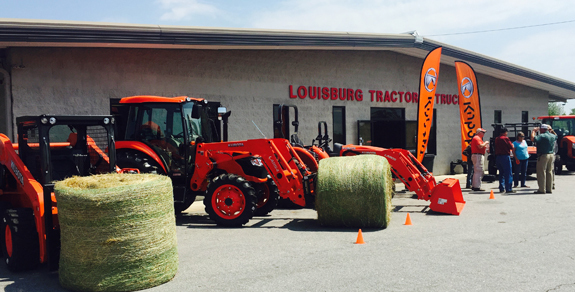 Visitors chat during the Louisburg Tractor & Truck Kubota Orange event day. Over 400 people attended the one day event held on Good Friday. They had an inflatable slide for children, food, a radio live remote and prizes. Winners of the Kubota Orca coolers were David Woodlief and Dan Edwards.